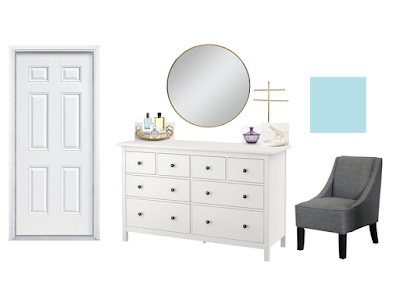 Today we start the concept designs for our Master Bedroom. The first design is for the wall to right of our bedroom door. This is where our dresser will be. I know that everyone and their dog has this Ikea dresser but I really like the simplicity of it. And I think that it pops against the light blue paint so nicely. On the left of the dresser we have a gold mirror tabletop tray. Over the years Erik has gathered quite the collection of colognes and I thought this would be a nice way to display it. Plus it gives him easy access so he can decide what smell he is feeling that day. On the right we have a purple trinket dish, a gold giraffe trinket dish and a gold necklace bar. This is wear I will store all of my jewelry. I love that they can be used as storage and decoration at the same time. Above the dresser we have a round gold mirror that we can use while getting ready. To the right of the dresser a gray accent chair. I wanted to add some extra seating in our room. It is also a great place for us to set our throw pillows while we sleep and a nice firm seat when putting on shoes.